MainJudaismRaising children: "Fair" does not mean "the same"
Raising children: "Fair" does not mean "the same"
The goal should not be to mold them into a uniform sameness so much as to elevate each one. Mass production is the manufacture of large quantities of standardized products, frequently utilizing assembly line technology. Henry Ford became a very, very wealthy man by doing one thing well – not developing the Model T but devising a method by which that product could be produced each exactly like the one before it and the one after it with incredible efficiency and therefore, reduced cost. He developed the moving assembly line. Henry Ford’s advance on the assembly line was a watershed moment in industrial capitalism. Thanks to Ford, we soon had efficiency and uniformity in products as diverse as cars, clothes and hamburgers. The ability to make many things the same is essential to quality control. The benefits of such production soon found their way into every aspect of life. Modern public education is predicated on “producing” students with a standardized body of knowledge; students who know how to stand in a straight line, behave in an auditorium and take their place as productive members of the community. “And now your two sons, who were born to you in the land of Egypt before I came to you in Egypt, are mine; Ephraim and Manasseh shall be mine, as Reuben and Simeon…” (Breishit 48:5). In Yaakov’s blessing of Ephraim and Manasseh, we are presented with a refutation to our culture’s determination to mold children rather than encourage their individuality. Here, each child gets his own blessing. This is not a case of “one size fits all”. As every good parent or teacher knows, treating children the same is the absolute worst way to be fair and just. As one long-time educator reminded her colleagues, “You never have only twenty-five students in your class; you have twenty-five only students…” That is, as a teacher you never have a singular class so much as a group of individuals. The goal should not be to mold them into a uniform sameness so much as to elevate each individual student. In Breishit, we see Yaakov embraces this understanding. He treats these two grandsons with such care and tenderness, acknowledging their individuality and specialness with his blessing. But wait! What about Yaakov’s other grandchildren? In blessing these two, is he “playing favorites”? It would be surprising if he was. After all, he had already paid a bitter price for his favoritism of Yosef over his other sons. Could he really be making the very same mistake with the next generation? The Talmud (Shabbat 10b) references Yosef’s sale and its tragic aftermath when it teaches that one should never show favoritism among one’s children. Certainly Yaakov, having cried bitter tears during the years he was separated from his beloved son, learned this lesson well. But here he seems to be favoring these two over his other grandchildren. Even with these two he seems to favor the younger over the elder. The crux of the matter is the confusion, so many seem to have between “sameness” and “fairness”. They are not the same thing. Indeed, to be fair, it is often necessary to treat individuals as, well, individuals. Which means, treating them differently according to their needs. Rav Yaakov Kaminetsky explains this in a way that is fundamental to an understanding of what it means to raise, educate, and guide children and students. Of course, he notes, there is a rule never to show favoritism. This is so basic as to amount to nothing more than common sense. But, explains the wise Rav Yaakov Kaminetsky, the deeper rule is that, “the exception proves the rule.” So, while we are not to show favoritism there are times when such “favoritism” speaks to the more fundamental truth. Every parent, every teacher knows that there are children that require more time, more effort, more attention, more concern than other children. Would it make any sense, would it be more “fair” to treat such a child as any other? Most children behave within the parameters that we consider acceptable. They get up, clean their rooms, make their beds; they go to school and do their homework. They brush their teeth and show respect to their elders. And then there are those who… well, don’t. Should we treat these “exceptions” as we do the others? Rav Yaakov teaches us that the causes for this difference can be varied – physical, emotional, or psychological. We see these differences from a very young age. Some babies sleep through the night. Some cry. Good parenting suggests that a parent recognizes the needs of his or her child and responds appropriately – which very often are different for each child. Some children need a peanut butter and jelly sandwich every day for lunch. Others, because of allergies, would become dangerously ill from the very same treatment. The same, of course, is true in teaching. It is easy to teach a classroom full of high achievers and dedicated students. I would suggest that the measure of a good teacher isn’t in how well he teaches his strongest students but in how well he teaches his weakest ones; how well he responds to the needs and demands of the “difficult” student. It is not the responsibility of those who are different to communicate that to us in a way we’re comfortable with. It is incumbent upon us to be sensitive and thoughtful enough to recognize how differences affect behavior. How did Yaakov know that Ephraim and Menashe needed to be treated differently from his other grandchildren? By being thoughtful. He realized that these two grew up without the benefit of family and community, no grandparents, no Jewish friends or family; just two youngsters in the middle of Egypt – the middle of nowhere from a Jewish perspective! Surely children growing up away from family deserve a bit of extra attention when they finally meet their doting grandfather! Even at this emotional meeting, Yaakov had the wisdom to discern the individual needs of the two and so favors Ephraim over Menashe. As Rav Yaakov explains, Menashe is the product of “ki nishani et kol amali v’et kol beit avi” (God made me forget all my hardship and all my father’s household). That is, he is an “old world child”. When Menashe was born, Yosef was still sensitive to all the hardships, to all the trials and tribulations of his life. This child was, and remained, a reminder of his own home life. But Ephraim “ki hifrani Elokim b’eretz onyee” (God made me fruitful in the land of my suffering) is a child of Yosef’s “new world”, of new experiences and opportunities, of good times. Of course, Ephraim needs to be treated differently than Menashe. Yaakov was sensitive enough to discern that if he were not treated differently, something bad could happen. He was sensitive and caring enough to know that without special handling he could be overwhelmed by pressure, just as we see in our own time as so many OTD children are crushed by the pressure of a system and community that should value and embrace them. Yaakov “crosses his hands” because Ephraim was special. Why can’t we likewise “cross our hands” in making sure our children don’t struggle with difficult futures? Some children are born to play football, others to march in the marching band. Some girls are born to be auto mechanics (yes, I met a young, observant woman who could change oil and rotate tires as well as any man!) So, while justice must be uniform, chinuch, child-rearing and education must be individualized. 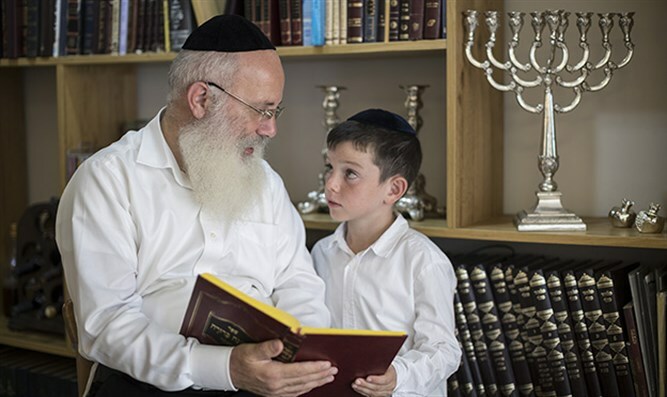 Rabbi Frand quotes the Nesivis Hamishpat which cites the latter half of Daniel 12:3, “...and they that turn many to righteousness like the stars for ever and ever,” interpreting it as does the Talmud as referring to teachers of young children. The Nesivos Hamishpat explains that this half of the verse must refer to teachers, whereas the first half of the verse, “and they that be wise shall shine as the brightness of the firmament” refers to judges. Teachers of young children are compared to stars because stars have different colors and brightnesses. Like stars, teachers need to be able to “teach to the student”, allowing for special needs and motivations to help a child succeed. Judges are called upon to dispense the same justice for all, but teachers and parents need to tailor their approach for each child. Every one of us is unique. Each has his own special talents, tastes, and manner of expression. Even groups of people that may seem alike at first glance are often a varied set of individuals. When Moshe took a census of the entire Jewish nation, he was careful to divide the census up into the different groups, tribes and families that made up the one unified, yet quite diverse nation. God made each of us different, and He wants us to make the most of ourselves by discovering, and expressing our unique gifts. If we all recognize the truth that each of us is unique, if each teacher and parent embrace that each student and child as a wonderful individual, then there is a good chance they will come out as stars. If not, we can only fear the darkness.